Google’s Freshness, or “fresher results”, update – as the name suggests – was a significant ranking algorithm change, building on the Caffeine update, which rolled out in June 2010. When Google announced an algorithm change on November 3, 2011, impacting ~35 percent of total searches (6-10 percent of search results to a noticeable degree), focusing on providing the user with ‘fresher, more recent search results‘, the SEO industry and content marketers alike stood up and took notice. 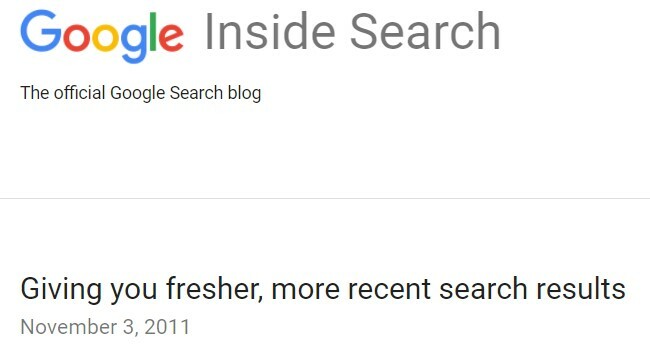 The freshness or ‘fresher results’ name for this algorithm update is directly taken from the official Google Inside Search blog announcement. 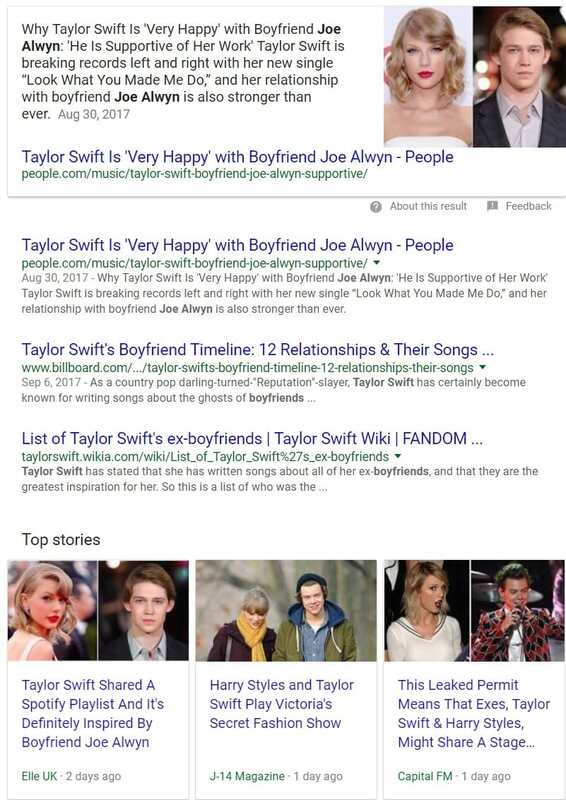 Someone searching for “Taylor Swift boyfriend” will likely want to know the current person she is dating, therefore content time/date stamped yesterday, with lots of social shares, engagement, and backlinks over the past few hours, will likely displace prior ranking content which has not been updated, or providing the same activity freshness signals. The analysis of the change was associated with the expected “big” impact from the Google announcement of 35 percent of search results being affected, and the actual disproportionately small amount of negative impact being reported. The Freshness update is one of my favorite Google algorithms as it makes perfect sense, and was impactful for changing SERPs for the better, in a logical, easy to understand, and practical way. If you’re covering a topic area and the information you have is out of date, time-sensitive, hasn’t been refreshed or updated in some time, or is simply being surpassed by more engaging, fresh and new competing content, it is likely that you need to give that content/topic some more attention, both on page and off page. An important part of the freshness update is that it is not just about refreshing content, but also tied to the frequency of content related to the topic. For example; the expected frequency of content prominently ranking during a political campaign spanning weeks, would reflect the latest campaign changes rather than static (even day old) content, with since surpassed relevancy, accuracy, and associated user engagement and social sharing signals. Look through year on year, or even previous period content performance. Identify pages/topics that previously drove volumes of impressions, traffic, and rankings to the website, and prioritize refreshing them. You may find that time and date stamped content in blogs, news, and media sections, have seen significant data change/drops. If this is the case, consider the value of updating the historical content by citing new sources, updating statistics, including more current quotes, and adding terms reflecting latest search queries. Social signals, fresh link signals, and associated external interest/buzz surrounding your content can fuel ranking gains tied to QDF and previous algorithm updates like the Freshness update. Don’t underestimate the value of successful social sharing and PR activities driving new content discovery, engagement, and interaction. If your website covers industry change, key events, and any degree of breaking news/insight, you may need to think about the frequency that you are informing your audience, and adding content to your website. People are digesting more content than ever before, and users demand the latest news as it happens – minor frequency changes can make a positive difference between being first to market, or being late to the party. With voice, video, images, virtual reality, and a host of content types, plus common website inclusion approaches (blogs, news, media, content hubs, microsites, more), adding layers of content to your digital offering will enable broader visibility of the brand on key ranking areas, plus extra leverage of the various search verticals at your disposal. Whether these updates result in new landing pages or adding of depth and content value to existing URLs, will differ on intent, but either way, this will support many of the freshness points relating to recovery or gains tied to this update. Targeted application of expertise on a given topic. Refined content that gets updated every few months when changes require modification. Longer form content (often in the several thousands of works criteria). You may see this as your hero content pieces, those warranting budget, promotion, and reinvestment of time and resource. How Successful was the Freshness Algorithm Update? Although the Freshness Algorithm change isn’t frequently mentioned in many industry topical conversations and often gets overshadowed by the likes of Penguin, Panda, Hummingbird, Mobile First, RankBrain, and others, to me, this reinforces the level of success it had. These useful and changing (often changing by the hour) results reflect the practical benefits that this update has had to our search experience, and the opportunity this brings to value-based companies, able to act on the latest data. The biggest misconception related to this algorithm update was the anticipated negative impact tied to the scale of results (~35 percent) that would be applicable to Google Freshness. As this was one of the more positive and practical algorithm changes, the freshness update has been overlooked by many, playing the role of unsung auditor of tired, unloved content needing to be improved, and of active content use able to satisfy searcher needs, and rank for more time-sensitive user intent.